Colson, P. et al. HIV infection en route to endogenization: two cases. Clin Microbiol Infect 20, 1280-1288 (2014). I’m really not happy about it. I don’t think the research funders will be happy about it either. Especially not the authors (who are the copyright holders here). Below is a screenshot of how the content was illegally on offer for sale, for $31.50 + tax. To investigate if it really was on sale. I decided to make a test purchase. Just to be absolutely sure. Why not? The abstract looked interesting. The abstract was all I was allowed to read. I wanted to know more. The article was originally published online by Wiley. As clearly indicated in the document, the copyright holders are the authors. The work was licensed under a Creative Commons Attribution-NonCommercial-NoDerivatives 4.0 International license (CC BY-NC-ND 4.0). Wiley respect this license. They make this content freely available on their website here. The authors, or their research funder or institution probably paid Wiley money to make sure that the article could be made freely available to the world. 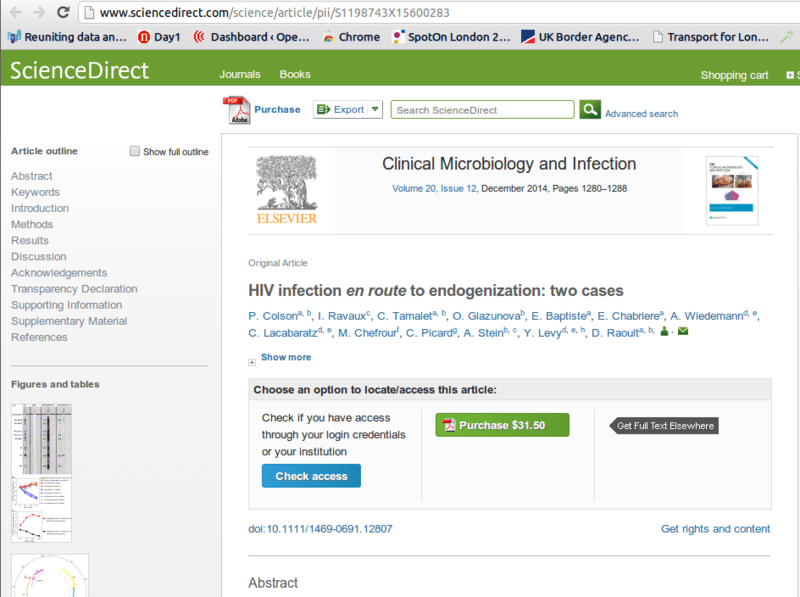 But tonight, Elsevier were selling it to me and all the world via their ScienceDirect platform. This is clearly an illegal copyright infringement. I have tweeted Elsevier employees @wisealic & @TomReller to see how I can get a refund for my purchase at the very least. This article should never have been on sale. I have also contacted the corresponding author (Didier) to see what his thoughts are. I do hope the authors will take legal action against Elsevier for their criminal misdeeds here. Could be just an error, but if not, it would not be surprising to see Elsevier do that. Making money using someone else’s work contributing very little to it (here’s our template you have to use), that’s the business model of companies publishing research. Scientists and academic administrators are also partially responsible for this state of nowadays science. Many of them willingly make Faustic deal with these companies that basically says they hand off their legal rights to the publishing company, while they get scientific credit for the publication and build their career. Who pays for this mutually beneficial cooperation? By large, all taxpayers; both for the research and for acquiring the journals into libraries. And if they want to read online the results of research they payed for, they need to pay the publishing company 30$ per article or more. How ridiculous. Consider ceasing cooperation with the deplorable publishing subjects thus helping to their greedy and wrongdoing activities. You can publish your research on your university web instead. Or publish yourself on your personal web. It takes no more than a few days to learn how to do that, and it is a valuable skill generally. The web pages are already being indexed for free by web search engines and served to people for free (or for seeing some ads, which is not as bad). You may want to ask if the copyright holders gave Elsevier permission to charge for the article as a condition of distribution through the ScienceDirect platform. If so, then charging for the article is perfectly acceptable. CC licensors always have the ability to grant more permissions than the underlying license gives, or to distribute their works on altogether different terms. This is because all CC licenses are non exclusive. Hi Diane, thanks for the comment. I presume the authors thus only had dealings with Wiley during submission and publication. It’s vanishingly rare for academics to have contact with the publisher after the article has been published, especially with respect to rights issues, right? On 1st January 2015, the journal then changed hands from Wiley to Elsevier. I assume Elsevier lazily copied across all the content and neglected to replicate the holes allowed through the paywall by Wiley’s ‘hybrid’ open access scheme (nevermind that CC BY-NC-ND isnt OA). I have had a reply from the corresponding author and he seems unaware that Elsevier are selling his article. Likewise I have contacted the academic society that is associated with the journal and they are now “investigating” the issue. I guess what you’re suggesting is theoretically possible. But the response I got from Didier (the corresponding author & editor of the journal!) 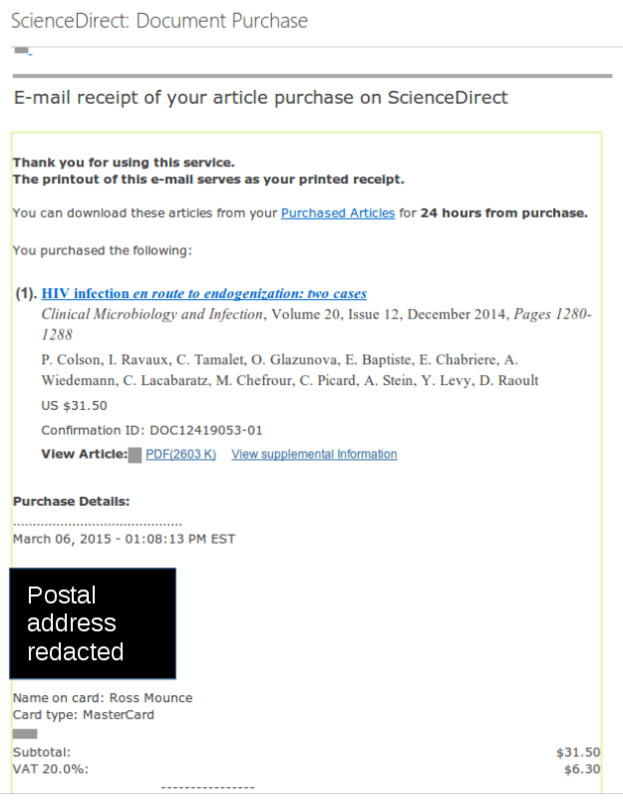 seemed not to indicate that he or any of the authors had given Elsevier permission to sell this article. There are many things wrong with this behaviour. It may well have been an error but at what scale? There are likely thousands of CC-BY-NC & ND licences in the Wiley collection. How many were treated as being copyrighted by Wylie in the transition to Elsevier? The notion that Elsevier charge because it’s available through ScienceDirect platform is an egregious interpretation. The authors paid for CC publishing. Elsevier is charging the same rate as for non-CC material. This is another case of double-dipping. There is a (tiny) marginal cost of making the paper available online. That charge was paid in advance by the authors 1000X over. Moreover, including the content in ScienceDirect enhances the value of ScienceDirect as a whole. I hope Elsevier correct this and ensure all CC content is freely accessible. The cable TV companies are rapidly scrambling to survive against the online access to content which is a la carte and avoids bundling of channels no one watches. The traditional publishing industry is making a mistake if it thinks it can adapt by creating a hybrid model where it gets to double-dip OA and demand bundled subscriptions. The only thing keeping this arcane road to profit alive is that universities have yet to find a way to migrate subscription fees to article processing charges. It’s coming. All Elsevier has to do is not sell the content but rather sell the access. Just because creative commons content is creative commons, does not mean that the content must perpetually be accessible, these are publishers, not archives. Secondly, Elsevier is making the content “additionally accessible” through its business “intelligence”. It could “sell” the “ease of access” to free content without selling the content. This title recently transferred from Wiley to Elsevier and there was some missing metadata for some of the OA articles. Thanks for flagging this up. We are taking steps to add the metadata to the articles today, and will of course reimburse you for your purchases. We will also investigate whether anyone else has purchased PPV access to the articles, and reimburse them as necessary. Please note that there is one issue of possible misunderstanding in your blog post. There is a difference between the rights the publisher has in the article as a result of our license to publish, and the rights conveyed to end-users by the CC-BY-NC-ND license.